Infanta Margarita of Spain, Duchess of Soria and Hernani celebrates her 74th birthday on March 6th. 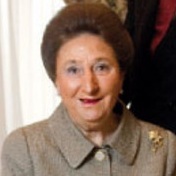 A younger sister of King Juan Carlos I of Spain, Margarita was born in 1939 in Rome, Italy and has been blind since birth. The youngest child of the late Count and Countess of Barcelona was born during the Royal Family’s exile during the final years of the Spanish Civil War. Margarita has an older sister, Infanta Pilar, Duchess of Badajoz. On the 12th of October, 1972, Infanta Margarita married Carlos Zurita, a medical doctor at Estoril in Portugal. Upon marriage the Infanta renounced her and her children’s rights to the throne. The couple have two children, Don Alfonso Juan Carlos Zurita y de Borbón (born in 1973) and Doña María Sofía Emilia Carmen Zurita y de Borbón (born in 1975). In 1981, she inherited the Dukedom of Hernani and was also granted the Dukedom of Soria for her lifetime by her brother. Pardon me, but she was born in 1939 not in 1938. Hence the age of 74. The best wishes of health, high spirits and joy in life ! Renatus the article states she was born in 1939 and has turned 74 so pardon you!